Here you have it. 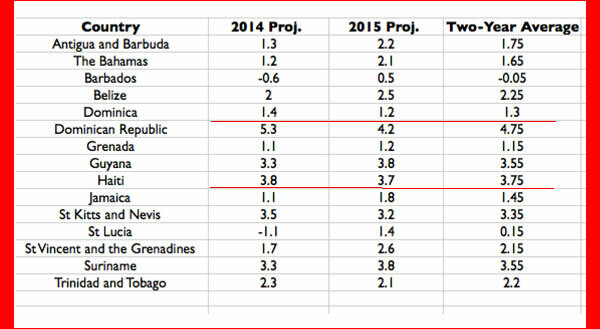 All the predictions suggest that Haiti has taken off economically. The slogan that Haiti is open for business may have some truth to it. In 2014, the Dominican Republic is projected to grow economically by 5.3 percent of their GDP. At the same time, Haiti is expected to grow by 3.8 percent. In 2015, the two nations are expected to grow at even a higher rate. Dominican Republic is projected to lead the region with a GDP growth rate of 4.2 percent, with Haiti at 3.7 percent.